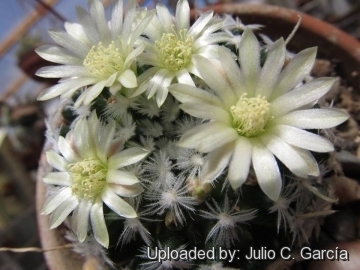 Origin and Habitat: This species is found at one location northeast of the city of Guanajuato, Mexico (extent of occurrence and area of occupancy 35 km2). Altitude range: 1.800 - 2.000 metres above sea level. Habitat: This species is found on volcanic rock in xerophyllous scrub. 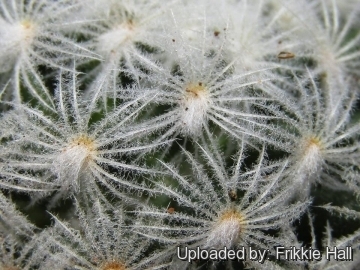 Mammillaria duwei is known from only one location, has a small population size, and there is a continuing decline due to overcollection and development. The southernmost of the two known subpopulations of this species has declined as a result of collecting over the past 15 years. Currently the total population is estimated at approximately 500 individuals. 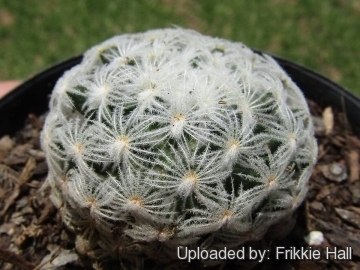 Description: Mammillaria duwei is a small solitary rarely offsetting plants that eventually forms tiny mounds. 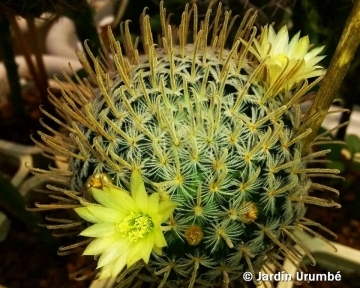 Taxonomic Notes: Mammillaria duwei is considered a synonym of Mammillaria crinita by Anderson (2001) and by Fitz Maurice (2002). 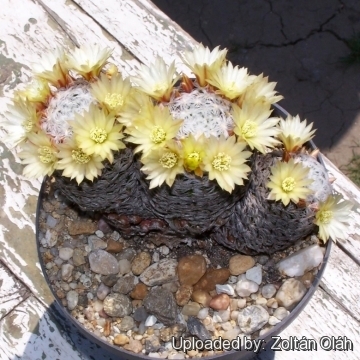 Considered a provisional species by Hunt (1999) and a subspecies of Mammillaria nana by Pilbeam (1999). Stems: Heads 3,5 to 6 cm in diameter, 2-4 cm high, dark green, soft, globoid, flattened-globose, to shortly cylindrical. 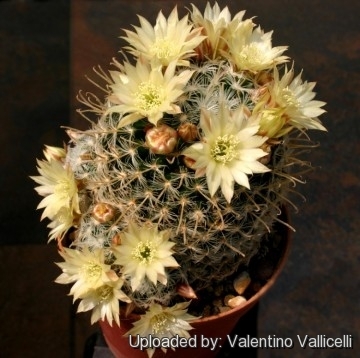 4) John Pilbeam (1999) "Mammillaria The Cactus File Handbook" - page 203. 5) Fitz Maurice, B & Fitz Maurice, W.A. 2013. 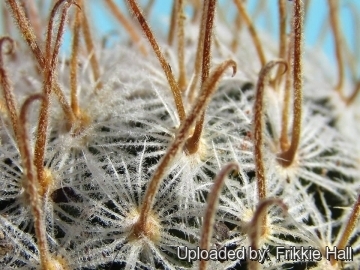 Mammillaria duwei. The IUCN Red List of Threatened Species. Version 2014.3. <www.iucnredlist.org>. Downloaded on 31 May 2015. 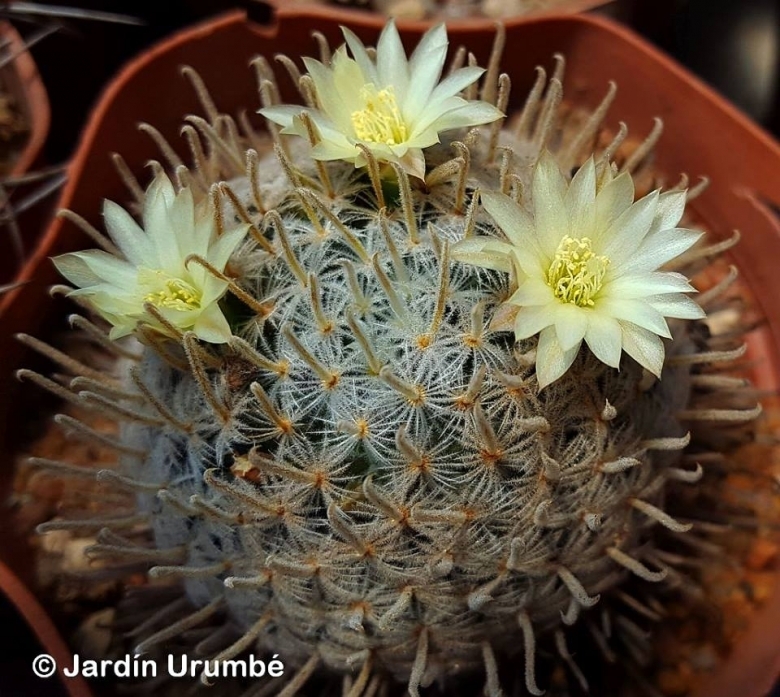 Cultivation and Propagation: Mammillaria duwei is not the easiest to grow of the mammillarias, more rot prone than most and more demanding regarding soil conditions. Watering: Water regularly in summer, but do not overwater (Rot prone), keep dry in winter. 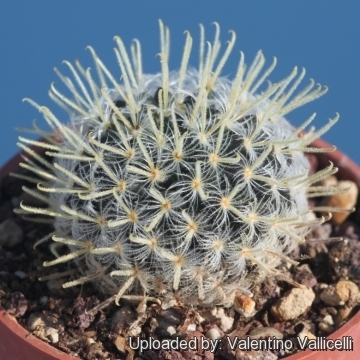 Keep Mammillaria duwei in very dry and ventilated place especially in winter.